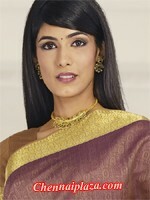 Lady's Fashion > Sarees > Cotton Silk Special 2010. Item color Copper brown cont. Item Description Elegant looking copper brown/wine contrast colours combination based cotton silk saree having self floral motif design interspersed all over body complimented by a wine colour pallu and border having intricate floral and geometric designer zari work decoration. 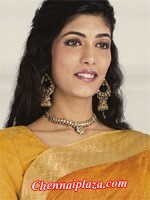 Item Description Beautiful looking orange/golden contrast colours combination based cotton silk saree having self creeper motif design decoration interspersed all over body complimented by a golden colour pallu and border having intricate floral and geometric designer zari work decoration. Item Description Lovely looking purple/brown contrast colours combination based cotton silk saree having self creeper motif design decoration interspersed all over body complimented by a brown colour pallu and border having intricate floral and geometric designer zari work decoration. Item Description Fabulous looking peach/cream contrast colours combination based cotton silk saree having self creeper and mango motif design decoration interspersed all over body complimented by a cream colour pallu and border having intricate mango and geometric designer zari work decoration.